“The Barrymores, you know, really cannot be held accountable for their odd manners” … and the worst offenders were the Earls of Barrymore who partied their way through their fortunes in Regency London. Richard Barry, the 7th Earl, was perhaps the most notorious. Amongst the mix of his dangerous or expensive passions was the sport of boxing. History has somehow remembered both Richard and his wife practicing the sport of boxing, but would a high born woman in Regency England really have done this? We do know that the Regency was rather a racy time. 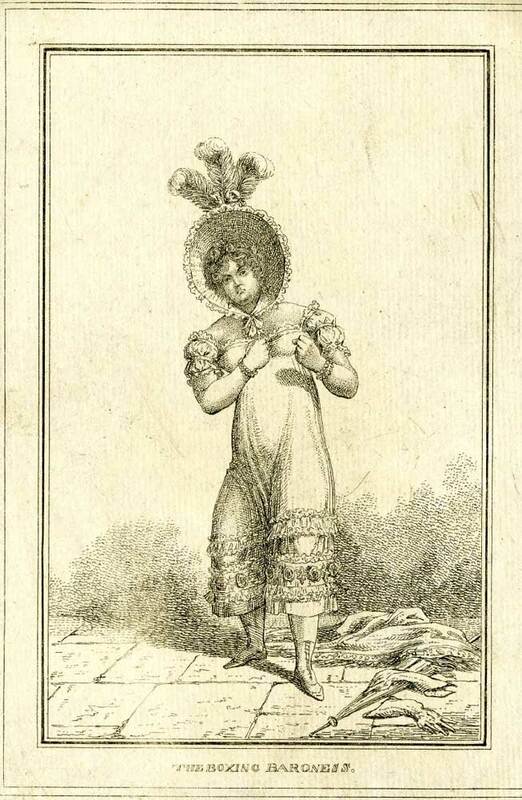 Or was “The Boxing Baroness” remembered in early 19th century prints instead Mary Ann, Richard Barry’s mistress in the late 1780s. When Richard left her and married another woman in 1792, poor Mary Ann may have been married off to one of Richard’s servants, but her association with the name Barrymore remained. By the 1820s Mary Ann was in the gutter, she was heavily dependent on alcohol and had tendency to use her fists on lawmakers who tried to arrest her. Hence could this have won her the title “The Boxing Baroness”. Mary Ann had descended from the luxury to penury, dying gin soaked in a garret near Drury Lane in 1832.